Offer valuable tips for your 4 - 7 days Lhasa tour itineraries. Tibet is a place full of legends and mysteries. Although it has long been known as a popular destination for tourists, many mysteries there are still not well explained. Is an abominable snowman really exists? What is the reason for the red snow happen in the Himalayas? Today we'll show you the top ten unsolved mysteries in Tibet travel and lead you into this magical place on the roof of the world. As one of the most amazing stories in the world, abominable snowman of Tibet(the Yeti) always has great appeal to the adventurers and the truth seekers. 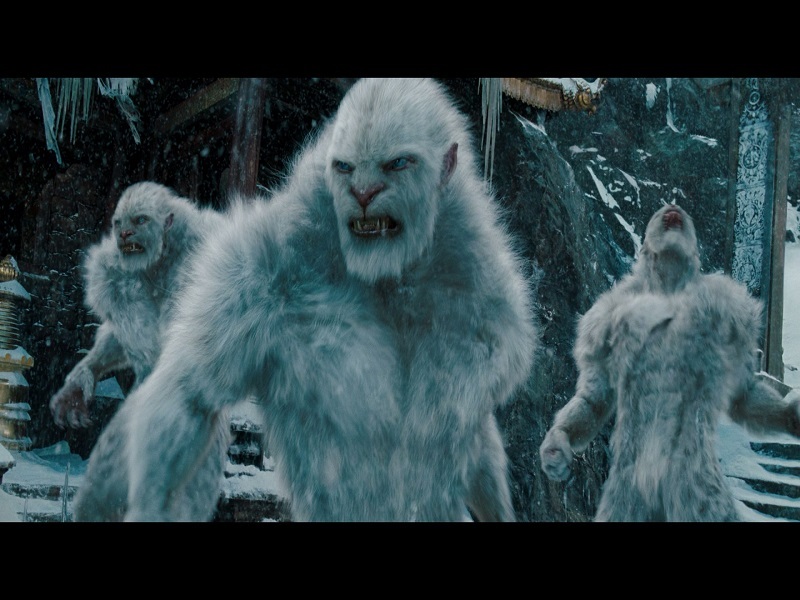 The record for abominable snowman can date back to 1784 when some people in the Himalayan area witnessed this incredible creature which was catching a man and taking him away for marriage. Some expedition teams have searched the eastern area of Tibet in recent years, however, whether abominable snowman really exists is still unknown to us. 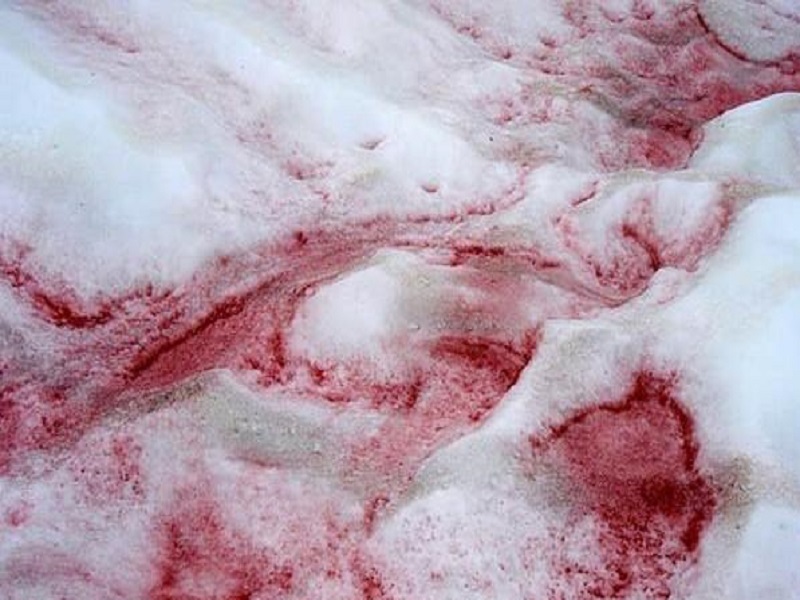 The ice surface at the altitude of more than 5000 meters of the Himalayas is often dotted with blood-red spots. Seeing from a distance, you may think that the snow is red before falling. Actually, this strange phenomenon is caused by various of algae which live in high altitude area. These widespread algae have a strong cold resistance that they can even be alive at a temperature of -36℃. It is because of the red pigment inside them that let the snow appeared red. Rainbow body is an incredible phenomenon in Buddhism. 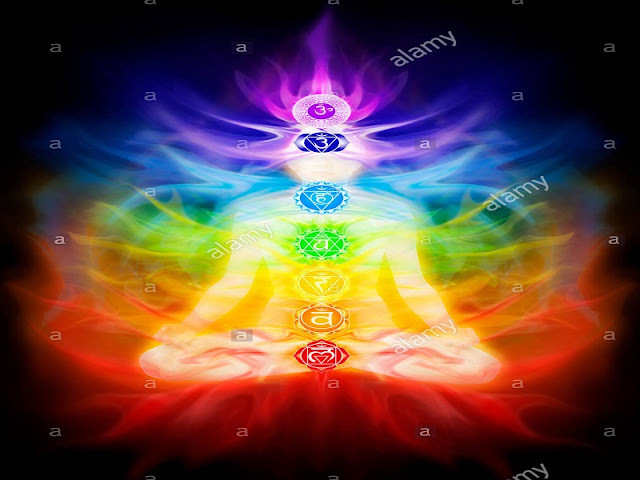 It's believed that when a monk who has achieved a very high level of spiritual insight pass away, his body will transform into a rainbow and his soul will get into the eternal supreme void. According to historical records, there are more 100,000 Great Adepts have entered Nirvana with a new form of existence since the middle of the 12th century. 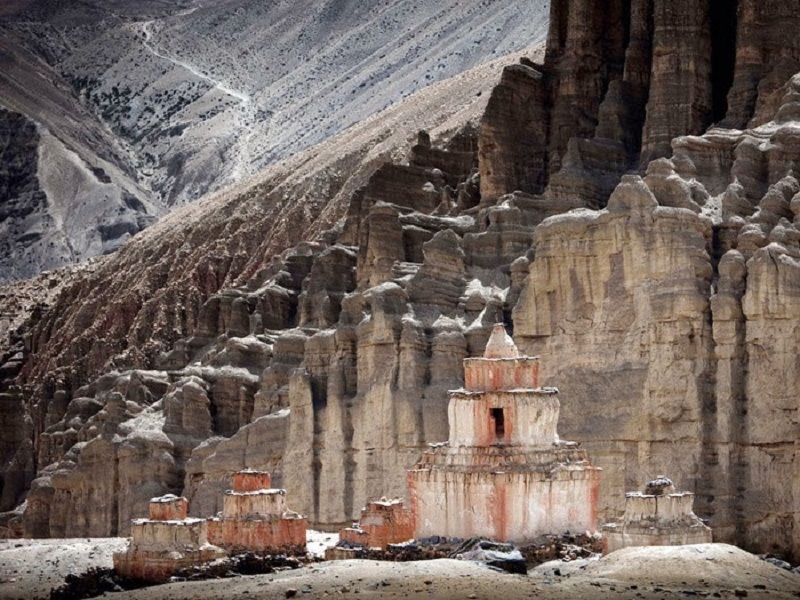 This could be the most shocking mysteries in Tibet. 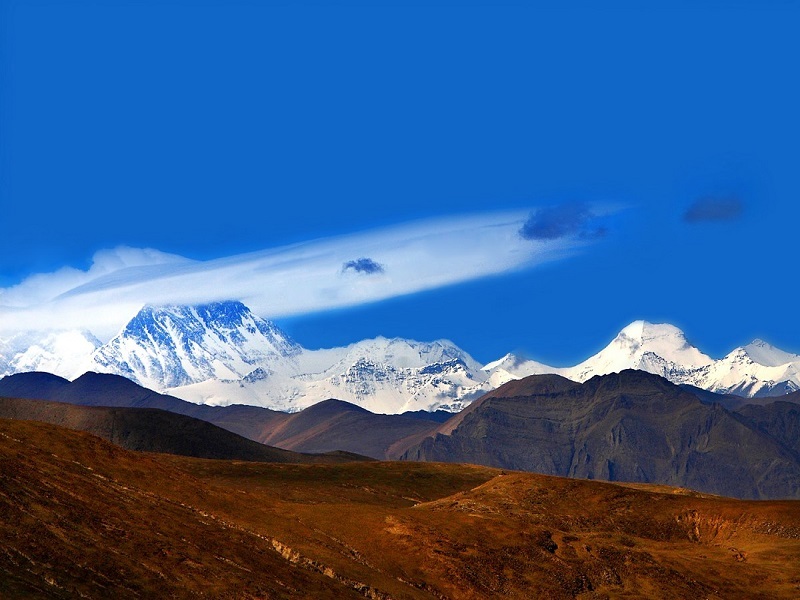 On a clear day, if you go on a Lhasa Everest Base Camp tour, you can find a milky cloud floating around the peak of Mount Everest like a flag. This phenomenon is the special conditions there. One can measure the wind speed near the highest pole on the earth by the position and height of the flag shaped clouds, so the Flag Cloud is also known as the highest drogue around the world. The Tibetans believe that it's lucky to see this propitious sign. Zhangzhung was an ancient country lied in the west of Tibet. With a history of more than 10,000 years, Zhangzhung was the oldest civilization on Qinghai-Tibet Plateau. According to archaeological researches and records of ancient books, Zhang Zhung had become a powerful kingdom in Tibet from the10th century BC when the famous Tubo Dynasty had not come into the world. The old Zhang Zhung once reached an extremely high level in civilization and had a profound effect on the whole of Tibet culture. However, this great country was conquered by Tubo Dynasty in the 8th century. From then on, Zhang Zhung suddenly disappeared. Today it's still a mystery of what happened to the missing kingdom. With the improvement of people's living standard, more and more travelers choose to take a flight to Tibet. At present, there are five airports built in the boundless Tibetan Autonomous Region, including Lhasa Airport, Nyingchi Mainling Airport, Chamdo Bangda Airport, Shigatse Peach Airport, and Ngari Gunsa Airport. Among the five airports in Tibet, Lhasa Airport in Gonggar county is the most popular airport in Tibet. Lhasa Airport is also known as Lhasa Gonggar Airport, Gonggar Airport, Lhasa Gonggar International Airport, or Lhasa Gonggar Airport. Situated in the high Himalaya mountains, Lhasa Airport was built in 1994. The distance from Lhasa Airport to Lhasa city is about 63.8 kilometers. It takes travelers about 1h 39m to drive from Lhasa Airport to Lhasa city. Crowned as the highest airport in the world, Lhasa Airport is located in the Gonggar County, Shannan Prefecture, Tibet. As the capital city of Tibet, Lhasa has become a popular place in travelers' eyes in the world. With thousands of years' history, Lhasa is attracting many international tourists by its traditional Tibetan cultures, unique Tibetan festivals, holy Tibetan temples, and natural scenery. Lhasa is also a modern city with modern museums, hotels, and restaurants. Thus, travelers will have a wonderful Tibet tour if they travel to Tibet in the right season. When you get off your transportation at the Gongkar Airport and head to Lhasa, you can visit a charming Buddha statue. Located in the north of the road, this statue has attracted many passersby to stop for a visit. You are allowed to take photos with this statue. As a combination of eight mascots in Tibetan tradition, the Eight Auspicious Symbols are the most common symbols around Tibet. Those who come for a Tibet tour could find them depicted in most places there like Thangka, the floors of some monasteries, and most of the Tibetan’ houses. The 8 auspicious symbols are bound up with Buddha and the Buddhist culture. The origin of these symbols could date back to the age of Buddha even earlier. Besides Tibetan areas and India, the 8 auspicious symbols can be also found in some countries of Asia. The Eight Auspicious Symbols including The Lotus, The Auspicious Knot, The Twin Golden Fishes, The Parasol, The Canopy of Victory, The Wheel of The Law, The Dragon Vase, and The White Conch. Each of them is a symbolic representation of Buddhist teaching and blessing.